(VOVWORLD) - Artist Tran Ngoc Nuong was born and raised in Can Duoc district, Long An province, the cradle of Don ca tai tu, southern Vietnam’s traditional improvisational chamber music. Although he can’t see anymore, he has devoted his life to teaching the music form to younger artists. Blind artist Nuong’s small house in Can Duoc town rings with the joyful sound of musical instruments and the voices of students who are practicing hard under the teacher’s instruction. There is often boisterous laughter by both teacher and students when somebody sings the wrong lyrics or plays the wrong rhythm. Don ca tai tu, also known as southern amateur music, evokes the people’s life and work on the land and rivers of the Mekong Delta region. In 2013, it was inscribed on UNESCO’s list of the Intangible Cultural Heritage of Humanity. Many people take Nuong’s class because of his expertise and dedication to the traditional form, which is evident in his way of teaching. There are many blind students in Nuong’s class. 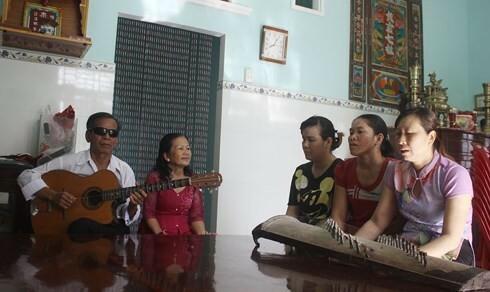 Those with talent and diligence make quick progress, because, with newcomers, especially the blind ones, Nuong is very patient, holding and placing their hands on their musical instrument gently urging them to sing again and again so that they will remember the songs by heart. Nuong was born in a family of 15 brothers involved in forging. At the age of 4, his eyes could no longer detect light. He began to learn Braille at the age of 14 and then to play the piano. Because his family was poor, he had to give up the lessons. He decided to save enough money to study traditional music and make a career of it to escape his dependence on his family. With a passion for traditional music and much hard practice, Nuong can now play a western guitar, adapted to Vietnamese music, but also the 2-string fiddle, and the moon-shaped lute. When he meets other blind people, he wants to take them to his home and teach them music which can help them earn a living. Nuong’s devotion to Don ca tai tu music and traditional musical instruments has inspired generations of learners. His life is a touching story of a talented person who overcame an unlucky fate and began sharing his accomplishment with others.